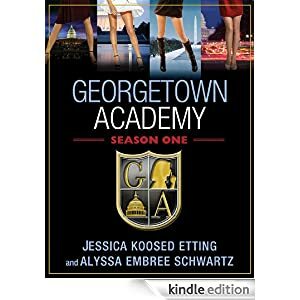 I was fortunate enough to get a copy of Georgetown Academy, Season One through a Coliloquy R4R on Goodreads and considering that I hadn't read any books in the series before I started, and then proceeded to read all four of them in two days, I’d say that the authors, Jessica Koosed Etting and Alyssa Embree Schwartz are a pair of extremely talented authors. Book One sets the stage with characters and setting, and I was hooked faster than a bass chasing a shiny lure (yes, I just made a fishing reference, I’m not sure what’s up with that, ha). Georgetown Academy is a private high school for Washington D.C.’s most influential politicians, so not only do the students have to deal with normal angst-y problems, but they also have to be extremely conscious about how their choices and actions will affect their parents’ careers. In essence, it’s kind of a nightmare. Well, it’d be my kind of nightmare, but these kids sure seem to love it. There are four main characters, all female (yay), and they’re about as different as you can get. First up is Brinley, who’s a BFD as far as her family history is concerned, not to mention that her father is the go-to-guy for PR on The Hill, and although she’s pretty snarky, it’s easy to see why she is the way that she is. Loyalty to her family is priority number one and because of that, she's often called to befriend people who she doesn't necessarily like. Not that she's fake, per say, but she has more responsibility on her shoulders than the average teen (and that would make anyone cranky, right?). Next, there’s Ellie, who is Brinley’s best friend and the daughter of a Senator. She’s much nicer than Brinley, but that doesn’t mean she’s a pushover. Ellie dates the biggest catch at G.A. and, as such, is one of the school's more prominent students. But, it isn't all sunshine and unicorns, though, as Ellie's been keeping a tiny secret that, if found out, has the potential to destroy her mother's career. Evan is kind of the geek of Georgetown, and a bit of an outsider as her family isn’t involved in politics (and she attends the school via a scholarship) but she’s an intern at a very influential political news show, so she’s knows all of the 4-1-1 regarding both the Republican and the Democratic parties. But, just because she's not personally involved in the drama doesn't mean she's far from it. Nope, not one bit. In fact, she even manages to find herself knee-deep in her own scandal swamp, as the series progresses. Finally, there’s Taryn, who was, hands-down, my favorite of the bunch (or, until the last book in the series, that is...Ooo, teaser! Haha!). She’s new to G.A., having moved from California, where her father was a mega-politician, and her West Coast mentality goes over as well as her penchant for hippie-style clothing and saying exactly what she’s thinking (in other words: not very well at all). But, when Taryn's father becomes a big deal in D.C., she'll have to choose between staying true to herself or succumbing to the voices that say she has to change. If the cool, layered characters aren't enough to pique your interest, here's another awesome thing about Georgetown Academy – it’s an interactive book! I know, right? It's amazing!! The chapters cycle through the four girl's points of view and then there's a point where you can choose which character’s storyline you want to follow! It was a genius move to bring back the choose-your-own-adventure-style and I loved it! And, naturally, I read all four perspectives because I was just too curious to pick one. Ha! There are about a thousand side-plots, which makes writing a review of all of them impossible (and spoiler-y) but rest assured that the combination of age-old teen problems and the pressure of politics creates a high-stakes story from page one. The second I finished Book One, I was on to the second because I couldn’t wait to see what would happen next! And man, are the other three books wearing their crazy pants, guys. Like, the kind of pants that LMFAO would wear, only brighter and with more sparkles (yeah, it really gets that crazy). All in all, GEORGETOWN ACADEMY was a fun, well-written series. I really liked the alternating points of view, and the authors created truly unique characters who leapt off the page and into my heart. So, if you like intense high-school drama that’s laced with American politics, then the GEORGETOWN ACADEMY series is for you! And trust me, you should just buy Season 1 instead of individual books because just like Pringles chips, once you pop that first page of Book One, you just can’t stop. Thanks to Heather and Katie for hosting, and have a great weekend, everyone! This sounds like a little fun to start with, but the fact that it's interactive is awesome. Definitely a perk to ebooks! I used to always read every option in choose your own adventure books too though, so I'm sure I'd want to read them all as well.